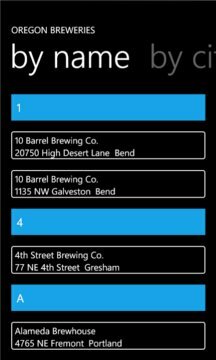 Oregon has one of the highest number of Breweries and Brew Pubs per person in the U.S. This app will give you directions to more than 250 of them - no matter where you live in the U.S. or Canada. Not only are there lots of breweries in Oregon but they produce some of the best beers in the world. In fact, both the 2014 and the 2012 winner in the World Beer Cup Champion Brewery and Brewmaster of a Small Brewpub category was the Pelican Pub & Brewery in Pacific City along the scenic Oregon coast. All told, Oregon brewers won 9 Gold metals in 2014. So if terms like, microbrew, craft beer, brewpub, or nano-brewery get you thirsty for beer, then this app is for you. See detailed information about each brewery. Give one a call, visit their web site to see their beer selections, or just get directions from your current location and go have a taste of Oregon's unique beers.